If you’ve stopped by this blog before, you already know I like book apps. What I haven’t shared nearly as often is my love for ALL types of books, especially mysteries, YA and middle grade novels, business and other how-to volumes, and even the occasional chick lit book. Because the only thing better than a good book is a good FREE book, I have found myself visiting a few special online destinations to help me be one of the first to know when a book shows up free or at a steep discount. For those of you looking for the best deals and free offers on apps, look no further than the Daily Deal Page at Digital Storytime. 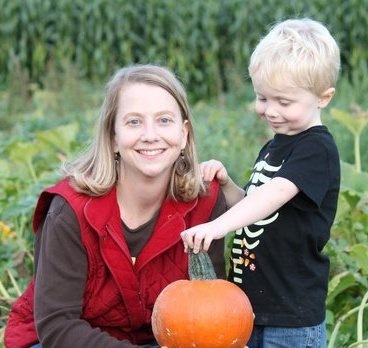 I don’t know how she does it, but Carisa Kluver (the muscle behind Digital Storytime) handpicks the best deals on storybook and other apps for kids twice a day! I LOVE it and check it at least every day or two. Free App Alert doesn’t specialize in book apps, but stories will show up in their daily listing of apps that are temporarily offered FREE. I have found many cool apps this way, mostly game apps. While I don’t actually own a Kindle, the Kindle app on my iPad gets a lot of use. And with the help of the following three sites, my wallet doesn’t have to be adversely affected (much!). My favorite Kindle deal site is Pixel of Ink. This site provides brief write-ups on books that have recently come down in price or are being offered FREE in the Kindle store. They seem to mention books of high quality, helping me separate the good stuff from the dreck. I admit I stop by the site a couple of times a day when I remember, but sometimes I need a bit of prodding. That’s where their Twitter feed, daily email newsletter and Facebook page come in handy. Another resource I recommend is Kindle Nation Daily. Run by Steve Windwalker (cool name, eh? ), this site has a searchable, continually-updated list of Kindle freebies, sorted with the most recent additions at the top by default. This is a complete list (with no curation), which is useful every once in a while when Pixel of Ink doesn’t mention something I think I might like. One I’ve discovered recently is eReaderIQ. They have a similar freebie listing to that found at Kindle Nation Daily, but they add a Recent Price Drops section that is generated by their readers and includes a wide range of prices. I like the icons that appear next to each title, showing you at-a-glance which books are lending and TTS enabled, etc. While I am quickly making the transition away from printed media, I admit this effort is sometimes stymied by my cheapskate tendencies. I refuse to spend $9.99 or above for a Kindle book I can get cheaper as a paperback. I take special delight in circumventing the outdated and no-longer-relevant new book retail process and getting books secondhand. The best way to do this is through PaperbackSwap.com. The idea behind the site is genius. Start by putting up for trade a pile of physical books you no longer want (paperbacks and hardbacks are welcomed, as are audiobooks). Agree to ship (at your expense) one of these books to another member who requests it. Doing this earns you a credit, which you can use to request a book of your choice from another member. I have scored many hard-to-find and out-of-print books through PaperbackSwap, which I love. If there is a book you want that isn’t available, just add it to your wish list. It might take a while, but someone will eventually post it, and the system will offer it to the next person on the wait list for that book. I also really like the fact that the books I don’t want any more get shipped to someone who is happy to receive them. Scored any free books lately? Got any other resources you’d like to share? Let me know in the comments. If you have an Apple mobile device and small kids, you probably a) look for well-made apps that are both educational and fun; and b) like to get good deals on those apps. Digital Storytime was created with both those needs in mind, and is turning into a must-bookmark site for busy parents like me. I was able to snag a few minutes of time with Carisa Kluver, Digital Storytime‘s creator/founder, who cheerfully agreed to answer my nosy questions! 1. As both an educator and a parent, you come at the concept of digital literacy from two valid perspectives. Tell us a little bit about your background. When did you realize that the iPad could be used as a digital bookshelf for your kids? When my 40th birthday rolled around in April 2010, my plans to celebrate in Vegas seemed a bit beyond our budget, so I ‘splurged’ on a 16GB wifi iPad instead. Within a month I was downloading kids books. I was a little stunned at how revolutionary the change in my own reading routine was with my own child. I am a lover of print kids books and never liked digital books on computers. My nieces & nephews make jokes about how I only send them books for every gifting opportunity–so much so that they would be stunned to get anything else from me. I never thought I’d be willing to transition from print to digital–let alone so quickly. 2. 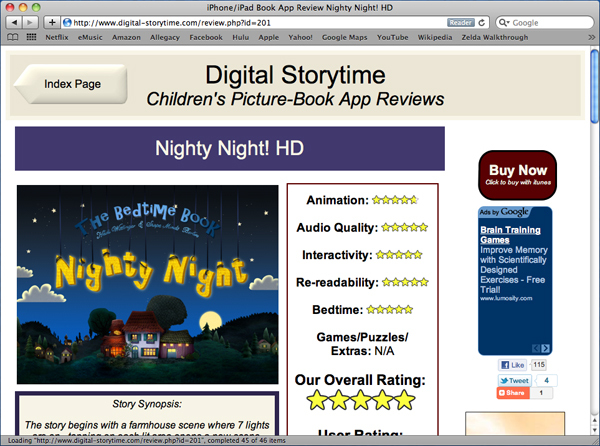 Digital Storytime is quickly becoming the site of choice for parents who want information and reviews of storybook apps for the iPad. What made you want to create the site? Long before the idea for our site, I loved finding good iPad kids books. But the shopping experience was dreadful. The kids books aren’t even separated out from the erotica in the app store. I also couldn’t afford my growing book app habit without serious bargain shopping. By October I had amassed over 100 book apps by watching sale promotions very closely. That’s when the idea to start my own site hit me. I was also talking to our local children’s librarian about the book apps and trying to describe them. She just looked confused and had never heard of these books. When I explained that they have no ISBN numbers, she was even more mystified. 3. I love how each app is rated on six different metrics (Animation, Audio Quality, Interactivity, Re-Readability, Extras and Bedtime)–I find this very helpful when I evaluate apps for my own kids. Have other parents responded to the site? What sort of feedback have you been getting? We are also in the process of several big makeovers for the pages on our site. The response to the first page to change, the deal page, was great. We really appreciate the specific feedback … things like the different colors for free and paid apps on the buttons came from a reader suggestion. We actually have two more categories I rate books on, Originality & Educational, that will debut with our site makeover later this month (May). 4. The Daily Deal page is a fantastic, time-saving resource for those of us who have limited funds (and who doesn’t?). Educational and book apps show up there whenever the price drops below their regular retail price (including FREE)! How did you get the idea for this great feature? My friends know me for being notoriously frugal. My deal-finding abilities in the non-digital world are legendary. In order to start the review site I needed lots of good books to choose from to fill the site quickly with reviews. I didn’t get promo codes for books at first, so I was industrious about finding free deals and watching for price drops on chart topping books. I even started following lots of developers on twitter to hear about deals more quickly. Once I started getting promo codes, I decided to turn this bargain hunting into the deal page to share my finds. At first, I just figured a couple good friends would download stuff … but it turns out the things I wanted in a site were things lots of parents & educators wanted too. 5. There is some controversy about the use of screens for reading with children instead of traditional printed books. As an educator and a parent, what are your thoughts on moving storytime into the digital age? This is a complicated issue. I do have concerns about screen time. That’s why I added the blog, The Digital Media Diet. Everything is about balance, mindfulness and being present as a parent (both literally and figuratively). I also think all screens (and content) are not created equally. I use my child’s behavior as feedback … if he is zombie-like and whiny after getting to play with an app, I can tell it is the kind of screen time that needs to be a treat, not the digital meal. A big thanks to Carisa for helping me out with the blog today! If you’ve never visited Digital Storytime, the Daily Deal page or the Digital Media Diet blog, head on over there and check it out! You can Like them on Facebook too. I don’t have a whole lot of time for games, but I couldn’t resist passing along this news of a fantastic sale on many of the game apps Electronic Arts has available in the Apple App Store–some as cheap as 99 cents. Included in the sale are Boggle, Yahtzee, Tetris, Monopoly, Life, Clue, Tiger Woods PGA Tour, Simpsons Arcade, and at least a half-dozen more. Here’s a review of the Scrabble app from a few months ago, so you guys can get a peek at how cool it is. And did I mention it’s only 99 cents right now? !